"People always say things like 'don't go down to their level'...well, I'm the first guy that goes down to that level." Artist and writer Todd McFarlane has, over the last 10 years, come into unbelievable fame and fortune, primarily due to his comic book Spawn, which has become the highest selling property in comic history. However, McFarlane is more than "that Spawn guy"; he's the guy who changed Spider-Man. I am not a huge fan of comics, although I did enjoy them when I was younger, but by then many of the big heroes were becoming stale. When McFarlane came on at Marvel Comics, one of his most famous acts was to take a fresh approach to Spider-Man, changing the style and taking the character in totally new directions. Had it not been for McFarlane's influence on the comic book world in general, I doubt the medium would have survivied in the late 1990s. In 1992, he did something else that would also revolutionize comics: he started his own independent company—Image Comics—in one of those historic, jaw-dropping moments. Previously, anyone who tried to go up against the "big boys", like DC and Marvel, typically failed, but McFarlane's success now opened the door for other independents. His flagship title was, of course, Spawn, a series that challenged the status-quo with its incredibly mature, dark and disturbing themes of good vs. evil. Nowadays, McFarlane is a millionaire with a media empire at his feet, but he's not one without controversy. This documentary, The Devil You Know, delves into the life and career of Todd McFarlane in a way that has not been done before. With the complete participation of the subject himself, the film takes a very personal approach to examining this figure with all his perceived flaws and strengths exposed. He might not be as most people envision him, but he and his wife are indeed talented business minds who have, in McFarlane fashion, arguably resurrected other forms of entertainment, like action figures, as well. Some see McFarlane as a great American success story, a comic book fan who eventually worked his way in and shook things up. Others see him as an egotistical, self-absorbed maniac, motivated by money. Through interviews with both family and friends, this portrait of McFarlane is presented to be as honest and accurate as possible, allowing viewers to decide for themselves. 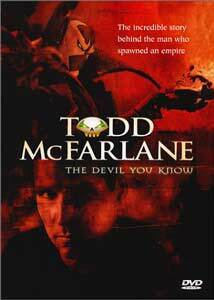 The Devil You Know offers an inside look at McFarlane's world in an extreme, up-close way—something few biographical projects accomplish with much success. It comes across unpolished and honest, much like Todd himself. Filmmaker Kenton Vaughn certainly does a fantastic job of organizing mountains of material to into a very concrete program. Documentarians often say that the closer they're allowed to get to their subjects, the harder it is to make a film; they're almost overwhelmed with information to work with. In this case, the elements balance out nicely, and the focus on Todd's comics and artwork remains central. The director does not shy away from the more violent and dark areas of Spawn, and the film feels more genuine because of it. If you are fan of McFarlane's work, or even have a casual interest, The Devil You Know is a fantastic opportunity to get the whole story right from the source, a must-see for the curious. Image Transfer Review: Shot on video, the program is transferred into a sharp, pristine image with no major issues. There does seem to be a lot of aliasing in the source material, however, perhaps related to the format. It doesn't really hurt the film, but it is obvious in certain places. Audio Transfer Review: The stereo audio track does the job nicely, but doesn't go into much else. Given that most of the program is interview material, it renders clean dialogue and the additional music score has some nice touches to it. Overall, it works very well for the subject. Extras Review: Perhaps the most interesting supplement is the art gallery, featuring a number of McFarlane's drawings, supposedly some of which have never been published. It isn't very large, but it does provide a good glimpse into his general talent. There is a promotional short dealing with Spawn, which functions as a sort of beginner's guide and details some of its history. There is a look at some McFarlane Toys products (which have totally raised the bar for collector figure molds), as well as a weblink to the official site. Whether or not you admire Todd McFarlane, The Devil You Know is an excellent look into his life and career; a major achievement as a biographical work.